As a luxury full-sized sedan, the Chrysler 300 will make an impression when you drive it around town. Available in eight different colors, you can choose a model that you love. Petrus Auto Sales can explain all of the different ways that you can customize the Chrysler 300. If you're looking for a vehicle that can handle itself in a variety of conditions both on and off the work site, check out the Jeep Gladiator. This addition to our lineup at Petrus Auto Sales is the only open-air pickup that's available. Under the hood, a powerful engine keeps things running nicely. The truck has best-in-class payload at 1,600 pounds as well as best-in-class towing at 7,650 pounds. Other features that make it easier to load things up is a three-position tailgate and an available roll-up tonneau cover. In the Dodge Charger, you'll be the center of attention as you drive on the roads. This vehicle has a muscular feel with its low profile, and many design elements can be included on the car to further enhance its style. The Blacktop Passage is a popular add-on that we see at Petrus Auto Sales. It includes a performance steering wheel with black paddle shifters, dark interior accents, a black spoiler, and either 19" or 20" (depending on the trim) gloss black aluminum wheels. Jeep has been providing drivers with popular SUV models since its inception at the height of World War II. With rugged durability and appealing style, the Renegade makes a great vehicle for around the town driving or for traversing mountain trails. All Renegade trims are trail rated, able to ford streams 19 inches or less in depth and to tackle rocky terrain with ease. The 101-inch wheelbase gives the Renegade the capability of hauling a boat or other personal recreation vehicles with sturdy reliability. If you are looking for a mid-size SUV, the Dodge Durango is top model at Petrus Auto Sales (DJR). Many consumers like this model because it is versatile and offers a number of features. The Durango offers three special edition feature packages. Let's check them out below. The Anodized Platinum Package comes with leather-trimmed seats with ventilation that give the interior a luxurious appeal. It also includes platinum badging, black roof rails, and a platinum front fascia and grille. This package also comes with 20-inch satin carbon wheels and platinum fog lamp bezels. When you first experience the plush interior of the Chrysler 300 series, you understand why it is one of the most popular full-size luxury sedans on the market. Not only does it feature ventilated heated leather trimmed front seats, it also keeps the latest technology right at your fingertips. Let’s take a look. Many consumersare impressed with the Ram 3500. At Petrus Auto Sales, we strive to keep our consumers informed about our models. The Ram 3500 is a capable heavy-duty pickup truck that offers three transmission options and two engine choices. A 6.7L Cummins Turbo Diesel I6 engine is offered with the Ram 3500. This engine is capable of 385 horsepower and 930 lb.-ft. of torque, and it has best-in-class towing of 30,000 pounds. The 6.4L HEMI V8 engine offers best-in-class horsepower. With this engine, you get 410 horsepower and 429 lb.-ft. of torque. The new Jeep Cherokee offers a high-quality cabin that has comfortable seating and soft-touch materials throughout. Honestly, this is the biggest cabin yet for the compact SUV. Cherokee has been totally re-designed for the new year, with a sporty exterior and all new options inside, including a long list of technology built into the main center console. The latest Cherokee comes with a new 8.4-inch touch screen as well as cameras and sensors that can save you in a tough spot. If you are thinking about making the Ram 2500 your next heavy-duty pickup truck, then you will enjoy the wide range of benefits that it has to offer. It is a popular choice at Petrus Auto Sales because of its innovative features. This pickup truck comes with three available engines and two transmissions. The 6.7L Cummins Turbo Diesel I6 engine offers best-in-class oil change intervals and can tow up to 17,980 pounds. Even with all of the performance and handling features that people try to get from their vehicles, there is one feature that means a lot for vehicle owners. This feature is the fuel economy. 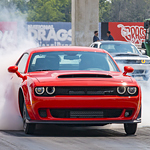 The 2018 Dodge Challenger has a great fuel economy that makes it easy to save money.